From Tortola, BVI to Las Vegas, Nevada! Welcome Jeron Smith! The National Tennis Foundation (NTF) is one of the beneficiaries of the funds raised through Premier Live and their Necker Series that takes place each November. Since Hurricane Irma and her devastation to the BVI last year, the Vegas chapter of the NTF has had the opportunity to step in and assist incredible student athletes who show amazing promise and huge commitment both on and off the tennis court! This allows youth tennis players who are dedicated to their game, their family and their studies a chance to relocate to Vegas and continue their training with equally talented NTF participants. Jeron Smith pictured left above. This past week, the Vegas Chapter welcomed Jeron Smith into their program. 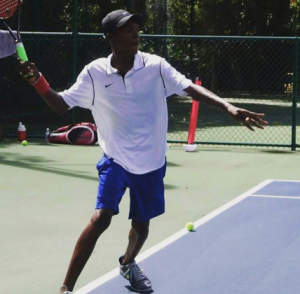 Jeron is based out of the Tortola Sports Club and has consistently maintained a #1 junior BVI ranking! Jeron is truly dedicated on and off the court and volunteers his Saturdays to coaching others and giving back! Unfortunately, Jeron and his family are one of so very many BVI locals whose lives were forever changed by Hurricane Irma when she wreaked havoc on their town September of last year. Jeron’s family, along with so many others, were left with next to nothing. As a true nod to Jeron’s character, this did not slow him down as he put his own training aside to step up and assist his community with the rebuilding efforts. In addition and at no charge, he volunteered his tennis coaching skills 6 days a week for 6 weeks to mentor and train other children who were unable to evacuate the island. We are proud of Jeron and his huge heart and strong commitment to his community, his academics and his talented tennis game. His story is not alone, and we are grateful for every donation and auction item purchased through Premier Live events. Last year alone the Necker Series auction raised $1 Million Dollars with most of the money being directed to Virgin Unite for the rebuilding and revitalizing of the BVI which was devastated by recent Hurricanes. Over the years, the funds raised have allow organizations like the NTF to nurture and encourage student athletes! Thanks Jeron for showing us what ‘Being Your Passion’ truly is! We are looking forward to watching this journey unfold for you! TENNIS HIGHLIGHTS As a junior tennis player, Jeron has won numerous tournaments, both nationally and regionally, and has maintained a consistent placement as the No. 1 junior in the BVI. He is the first BVI junior tennis player who holds a BVI passport to earn an International Tennis Federation (ITF) junior ranking, acquiring five points in his second ITF junior tournament in which he competed. In 2017, Jeron has competed in several ITF Junior tournaments in Jamaica, Trinidad and Tobago, Barbados, and Guadeloupe. GIVING BACK Jeron has also been a key asset for the Tortola Sports Club as a Teacher Assistant in Training on Saturdays with our free grassroots Kids Tennis Classes (all year round), as well as with our after‐school Little Munchkins Tennis Program (Tuesday through Friday during the school year) under the supervision of the Director of Tennis, Amine Elouazzani. 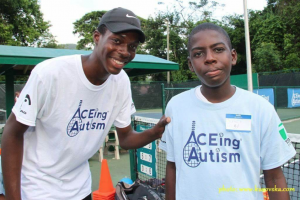 He also volunteered in the spring of 2016 as a Tennis Coach for a six‐week long pilot tennis program for children with Autism Spectrum Disorder in the BVI which was specially designed by a US nonprofit organization – Aceing Autism. From 2012 through 2016, Jeron was the Ball Boy Co‐Captain for Sir Richard Branson’s Necker Cup Pro‐Am Event held annually at Necker Island. Every year he assisted with training and mentoring ball boys and ball girls for this prestigious event. OFF‐COURT EXTRACURRICULAR ACTIVITIES In addition to his tennis obligations, Jeron has also made time to actively participate in several professional and social organizations. In tenth grade, he served as a President of a Junior Achievement Company at the Elmore Stout High School from which he graduated in June of 2017. As the President, he managed to lead the organization into earning profits exceeding one thousand dollars in just a few weeks of operation. He is also a long‐serving member of the Boys’ Brigade, a Christian‐based organization established to instill obedience, reverence, and discipline. For his contributions to the Boy’s Brigade, he has been awarded the prestigious title of Boy Brigadier of the Year, on three separate occasions. HURRICANE IRMA AND MARIA Jeron comes from a very difficult economic background from a very low‐income single‐mom family. The goal for him from September 2017 to September 2018 was to take a gap year after his June 2017 high school graduation and play as many ITF Junior and USTA tournaments as possible (if he would receive enough funding) to get ITF Junior ranking as well as UTR ranking in order to be able to apply to colleges in the US with hopes to earn a tennis scholarship. Unfortunately, hurricane Irma and Maria put a huge obstacle in his plans. Jeron comes from the East End of the Tortola island, where the damages to people’s houses were the most extensive. After the hurricanes, Jeron helped in his community with rebuilding, and in addition to that, he helped the coaches at the Tortola Sports Club and at Virgin Gorda Tennis Academy with providing six‐days‐a‐week for six weeks with free tennis to the children who stayed on the islands after the hurricane and didn’t evacuate. Due to the damages of the tennis facilities, he wasn’t able to train properly until November when we were able to secure one month of free training at the Junior Tennis Champions Center at College Park, MD. For him, this was the best month of his life as he was able to train every day with players better than him (which he doesn’t have in the BVI). Upon his return to BVI in January, Jeron continued to train as best as he could but the limited opportunities for high performance training and lack of competitive matches prevent a proper development. Having the opportunity to train at a successful tennis academy in the US would be the challenge he needs in order to keep improving his game and continuing with his application process to US colleges. https://nationaltennisfoundation.org/wp-content/uploads/2019/02/NTF-Logos-All_NTF-Master-Logo-300x173.png 0 0 Remington Reynolds https://nationaltennisfoundation.org/wp-content/uploads/2019/02/NTF-Logos-All_NTF-Master-Logo-300x173.png Remington Reynolds2018-05-14 18:26:102018-05-14 19:10:50From Tortola, BVI to Las Vegas, Nevada! Welcome Jeron Smith! The National Tennis Foundation has been very instrumental in supporting the South Atlanta Community Tennis Association. The NTF has been a major supporter our USTA Excellence Team by providing tennis scholarships for students in our excellence program. NTF has provided the kids opportunities to travel,tournaments and tennis equipment. The NTF Necker Cup, gave our kid and opportunity of a life time to see parts of the world and act as an ambassador for the foundation.NTF has provided funding for our kids to go to tournaments like the 2015 Orange Bowl in Miami Florida and NJTL Cup in Washington DC.Tennis equipment is available to kids less fortunate to aid in their sucess as a tennis player.These accomplisments would not have happen without the help of the NTF.The South Atlanta Community Tennis Association look forward to working with the foundation as it continue to enhance the lives of the kids in the Atlanta metropolitian area. My passion for tennis began at the young age of 6. I have always dreamed of becoming a champion, and this is the sport that has given me the opportunity to showcase the special talent that God has given me. I won my first tournament at the age of 8. I now have a national ranking in the USTA 18 and under, even though I’m only 14. I plan to play only ITF level tournaments after this fall in hopes of getting into some professional satellite events. My character, work ethic, determination and love of the game have been the foundation of my success and fuel my desire to continue to improve when times get hard. I also feel that the foundation that I’ve learned from training hard in tennis has helped be become an excellent student. Even though I train an average of 30 hours of week, I still made all A’s and one B last semester. It’s tough most days, but I’ve learned at an early age to do whatever I need to do in order to continue my dream of playing at a top college program and then being successful on the WTA tour. Tennis is very expensive, and requires many personal sacrifices. In 2007, at the age of 7, I was identified by USTA talent scouts and offered an opportunity to participate in a high performance junior development program in Atlanta, GA. My mom, dad and younger sister Lelah, made the sacrifice to move from my hometown of Greensboro, NC to move to Atlanta, GA My parents found jobs and uprooted our family just for me and that’s why I work so hard. Over the past couple of years, I’ve been receiving help from the National Tennis Foundation towards my training and tournament travel expenses. Rem and Trevor have also helped me indirectly, by mentoring me and giving me insight on how best to navigate through the process. I’m fortunate to have had a lot of help from different sponsors, from Wilson Sporting Goods, to COAN Tennis Association, to Sam Kennedy and South Fulton Tennis Center. With all that being said, there is no way my family could afford to keep me out here living my dream without the help of the National Tennis Foundation. I work hard every day to be a good ambassador for the Foundation and hope to one day be one of the success stories on the WTA Tour. I’m just a regular 14-year-old girl with big dreams. I enjoy watching movies, talking on the phone with my friends, and playing with my little sister. My coaches tell me that I have the work ethic, talent and size to make it to the WTA tour, as long as I keep working hard. It’s hard for my mom and dad to keep things going, but they always tell me to focus on working hard on the court and keep my grades up and God will make a way for me. So that’s what I do. I chose to believe and I am prepared to make the sacrifice.